With school back in full swing I love making simple and delicious pasta dishes. This week I came up with this amazing Turkey Spinach Pasta Casserole. It is so easy to throw together on busy school nights and is “SO yummy” according to JJ my 5 year old. All my kids asked for second helpings last night when we had it for dinner. This Turkey Spinach Pasta Casserole is packed with roasted garlic flavor since I used my go to Ragu Homestyle pasta sauce. Combined with the fresh spinach and ground turkey this casserole will become a regular dinner option in our house from now on. The Ragu Homestyle pasta sauce is their thickest sauce! 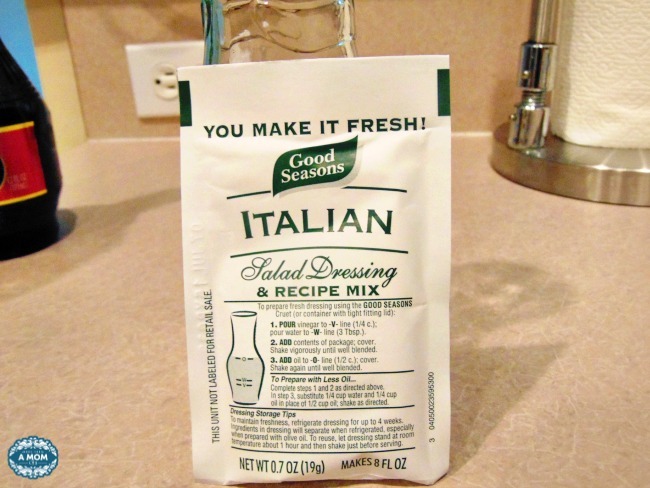 It soaks into the pasta making for the perfect bite every time. I really love that they don’t use artificial flavors, artificial colors or high fructose corn syrup in any of their Ragu pasta sauces. 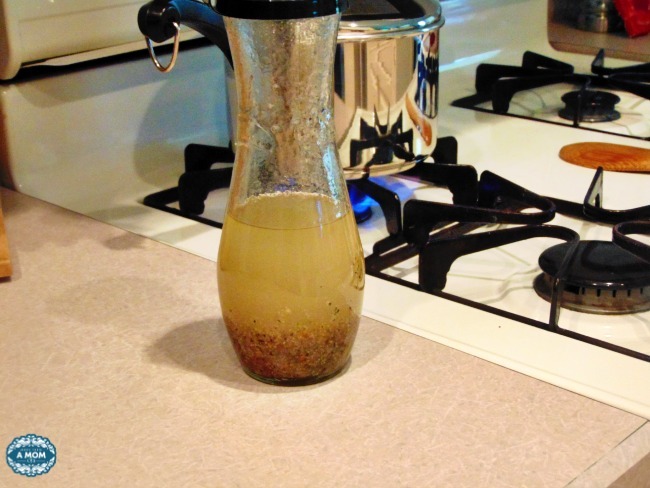 The sauce tastes like you have been slaving in the kitchen all day for an amazing homemade taste. Be sure to check out all the new Homestyle Thick and Hearty Traditional Sauces Ragu has to offer! And for more delicious recipes from Ragu Traditions Pasta Sauce. 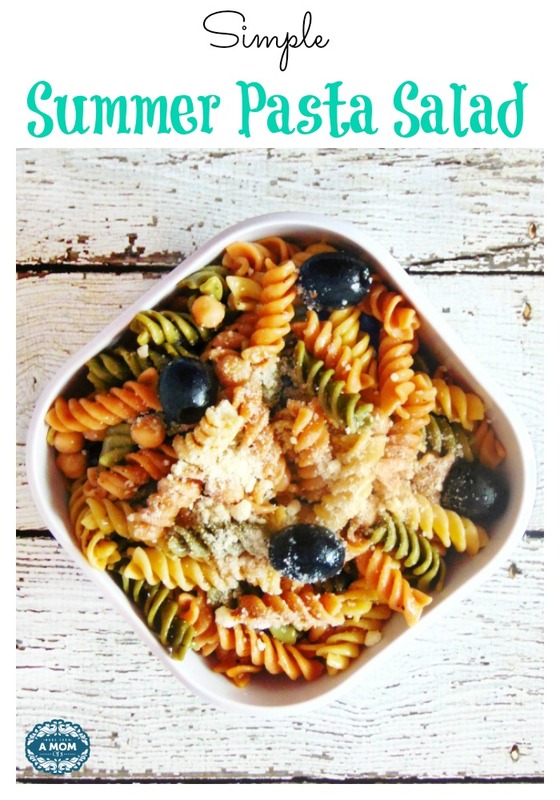 [yumprint-recipe id=’40’]Looking for more simple pasta dishes? My kids love their pasta dishes and I am always trying to come up with a simple yet delicious meal that I can make in less than 30 minutes. Pretty much pasta dishes are my go to since I know all the kiddos will eat it. This Spinach and Mushroom Bow Tie Pasta that I whipped up the other night was a huge hit with the entire family. Even my picky eater that claims he hates spinach asked for seconds! The biggest time saver for me to make a great pasta dish on those busy nights is the pasta sauce. These days I do not have the time to make a sauce from scratch so I turn to Ragu Pasta Sauce. Their new Homestyle Thick and Hearty sauces are just as great if not better than mine, since it tastes homemade. The Ragu Homestyle pasta sauce is their thickest sauce so it hugs the pasta and has that all day simmered flavor anyone would love. The best part the Homestyle Thick and Hearty Ragu Pasta Sauce contains no artificial flavors, no artificial colors and no high fructose corn syrup. This Spinach and Mushroom Bow Tie Pasta comes together in no time. You can serve it with a side salad and some garlic bread and you have a wonderful meal in under 30 minutes that the whole family will love! Don’t forget to check out all the new Homestyle Thick and Hearty Traditional Sauces Ragu has to offer! And for more delicious recipes from Ragu Traditions Pasta Sauce. Spring is here and summer is just around the corner so for me that means simple, light and no fuss dishes to serve my family. This is the time when pasta salads and slow cooker meals come to our table most since they are such little work to put together and I can focus on other things but still providing my family with a home cooked meal. 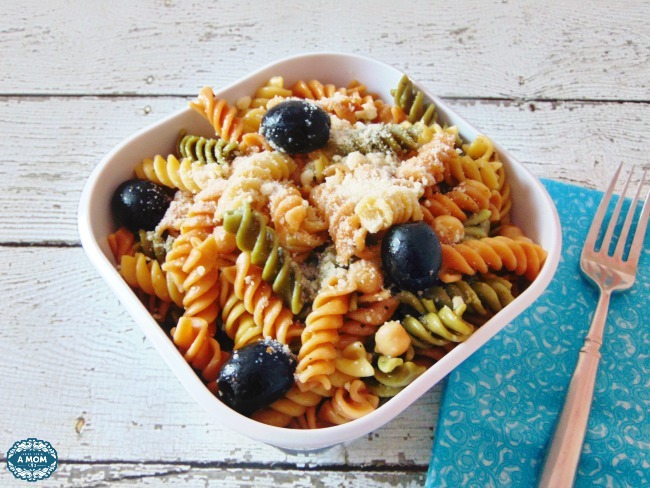 Pasta salads are great for entertaining or take to a pot luck too. You can make them the night before and serve them cold. 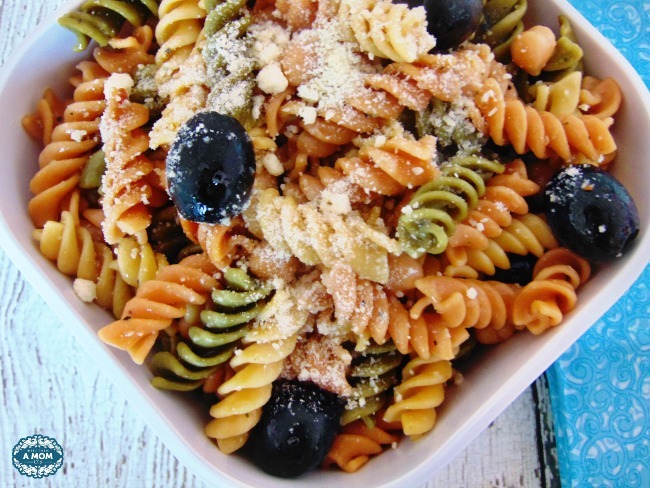 This Greek bow tie pasta salad can be served warm or cold, both ways they taste great and require very little prep and cooking time. Just what I need for the busy summer months. I hate spending hours in the kitchen when I could be at the pool with the kiddos and enjoying some sun! 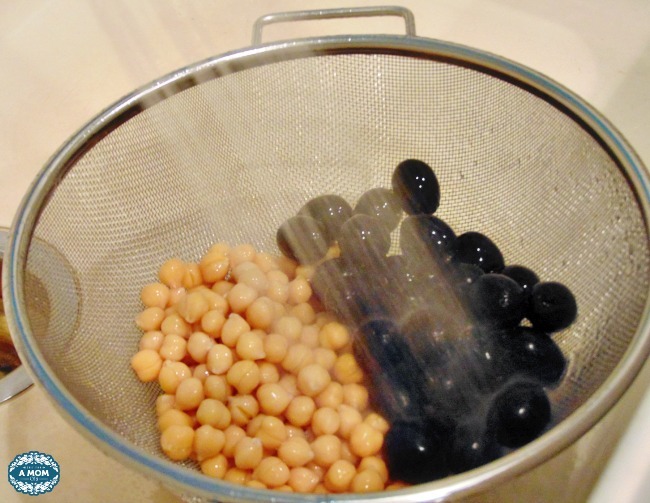 Bring a large pot of lightly salted water to a rolling boil. 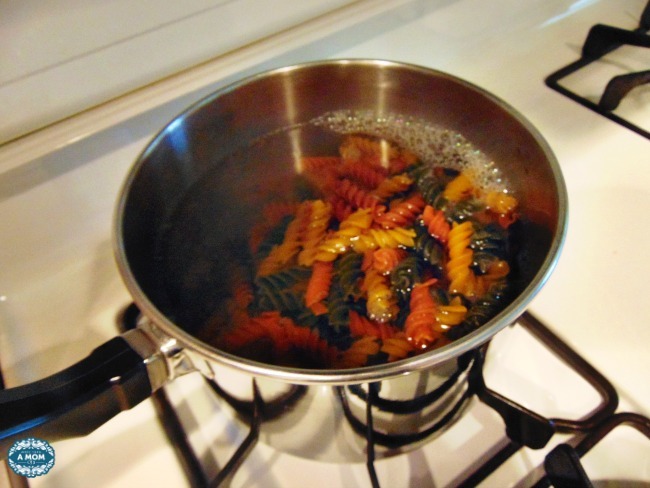 Add pasta and cook for 12-14 minutes, drain well. Serve warm and enjoy! Or you can let the Greek bow tie pasta salad cool in the fridge for a few hours for a colder version. Both are delicious!